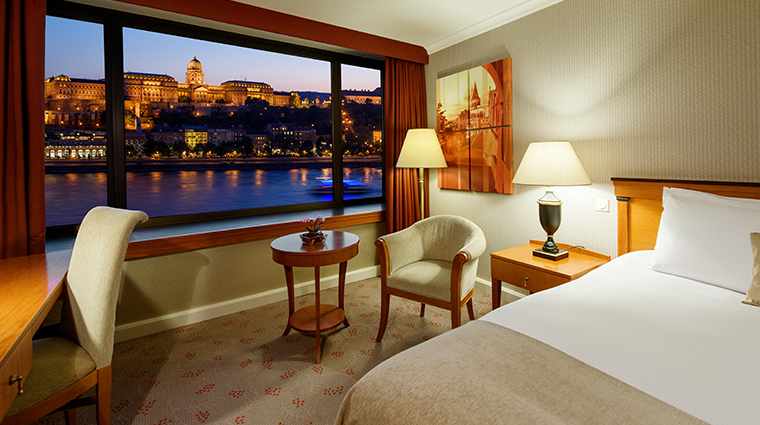 Located right on the banks of the mighty Danube river, with views of the impressive Chain Bridge, the opulent Royal Palace and the museum-speckled hills of the Buda side of town, InterContinental Budapest is in one of the best locations in the entire city. 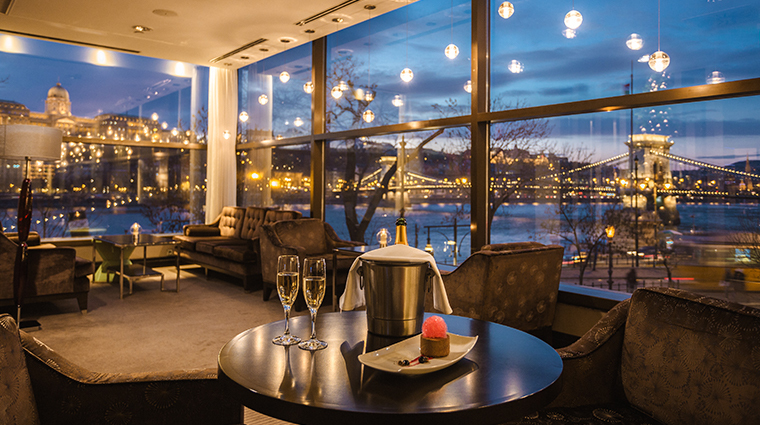 The highly coveted rooms that overlook the riverfront boast large, wall-length windows while Corso Restaurant and Terrace overlooks the same UNESCO World Heritage view while serving up Hungarian specialties. In addition to the winning vistas, rooms offer a host of contemporary amenities, including touch-screen smart panels in the spacious presidential suite and flat-screen TVs. 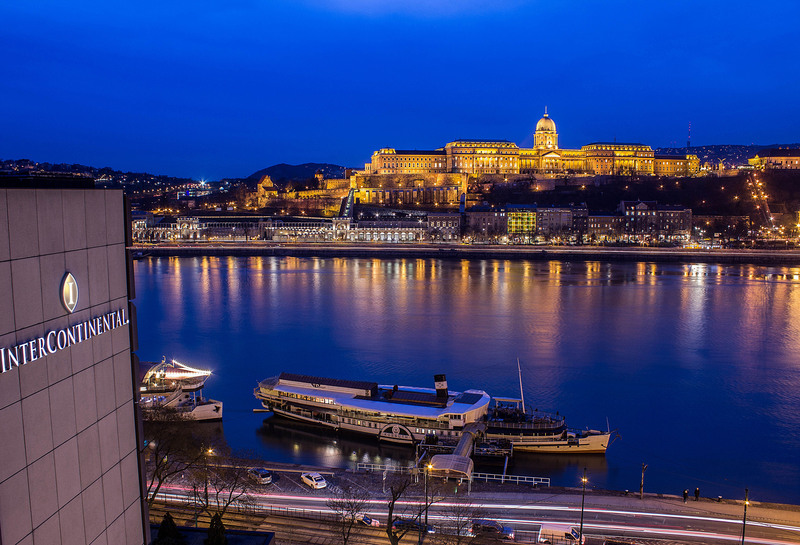 The Budapest hotel flanks the bustling Danube, and offers some of the best views of the famous Chain Bridge and the rolling hills of the Buda side of town. A favorite not just for tourists but locals as well is the hotel brunch. 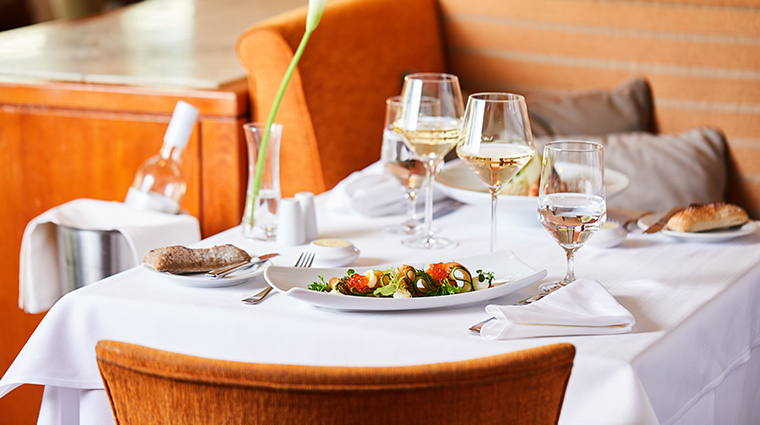 The Sunday spread is served on the outdoor terrace and it comes complete with mouthwatering Hungarian dishes like tripe with knuckle and marrow or beef stripes in a green pepper sauce. Spa InterContinental, which sits on the first floor of the hotel, has a wide range of Hungarian treatments and a thermal bath, which gives you a little more tranquil way to enjoy this countrywide pastime. Housed in a giant gray building with glass windows, InterContinental Budapest looks more like a dated office building than a high-end hotel, especially when flanked by 18th-century parliament buildings and medieval bridges. But don’t judge this book by the block cover, as the insides make up for the stark exterior. 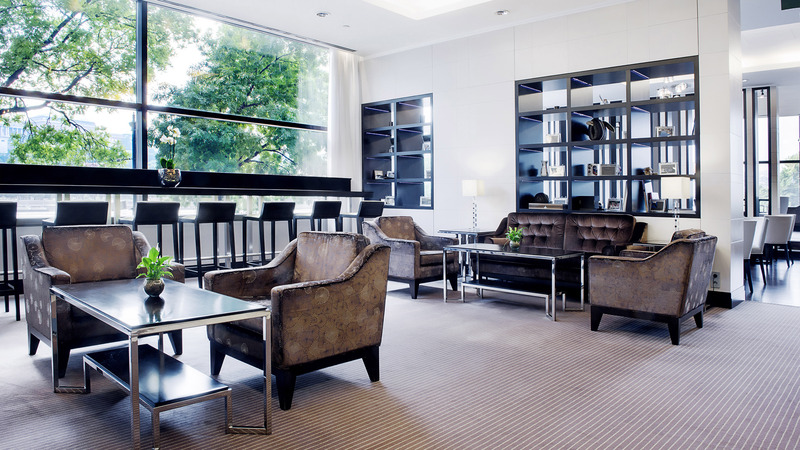 Thanks to a massive redo in 2009, the lobby boasts ample natural light, elegant furniture and art that’s representative of the city and its culture. The other public spaces were also redone to give things a more intimate, cozy vibe — which is often hard to do in a massive, 402-room hotel. Expect to find tufted chairs arranged in a circle to encourage mingling. Areas that lack the famous floor-to-ceiling windows have ample lights to make up for it. Room furnishings may lack some character but the modern amenities and incredible views of the city more than make up for it. However, you will find more personality in suites that feature large couches, bright Turkish pillows and bookcases brimming with tomes on Hungary’s interesting (and often tumultuous) past. 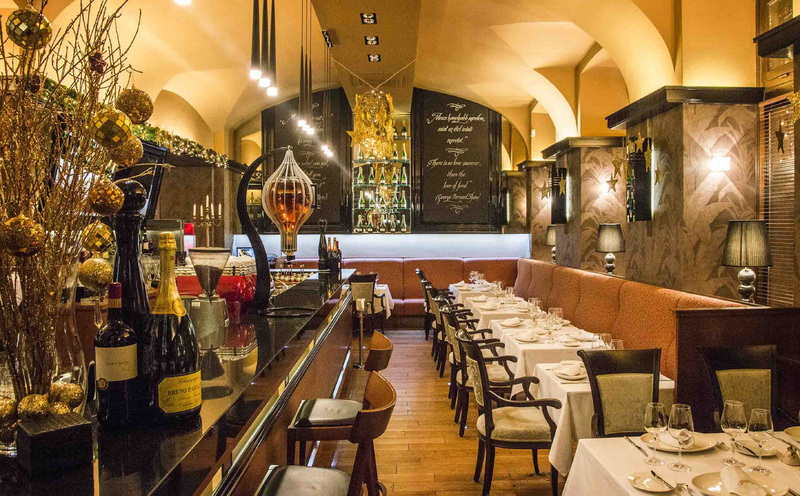 The fare found at the main restaurant, Corso, is a mix of upscale Eastern European classics and new-age takes on Hungarian favorites. Refreshingly innovative for a luxury hotel restaurant, Corso’s bites come outfitted with fluffy foams and decadent drizzles. The menu changes by season, but you’ll always find certain staples regardless of the time of year – like the duck foie gras with spiced apple chutney. Most of the 402 rooms and suites feature a very similar look and feel. The beige couches are outfitted with red accents. The beds are all made in fluffy white duvets. The artwork all match the same red-orange-brown-and-taupe color scheme. Gadget-wise, each room offers a flat-screen TV and an iPad for push-button requests. 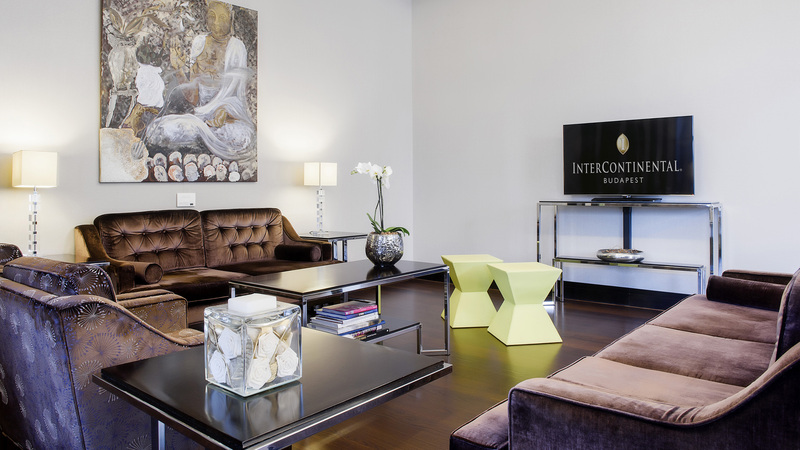 The suites feature livelier pops of color — from the bright green, yellow and blue throw pillows to the oversized Turkish and Hungarian artwork. If you’re in the Junior Suite or above, you gain access to the InterContinental Club, a perk that offers complimentary cocktails, appetizers, VIP check-in and a first-floor location with sweeping views of the city. The most impressive suite, for sheer size and ambience, is the Presidential Suite, which has nearly 1,400 square feet of living space, a touch-screen smart panel, a full dining room table, a cozy couch right next to the panel of windows. Bright pillows and Turkish-inspired lamps add a pinch of Hungarian flair to the space. The bathrooms are also huge, with a large soaking tub, his and her sinks and a separate walk-in shower. Appealing to the hotel’s rather large influx of business travelers, every room (including the standards) comes with a writing desk. 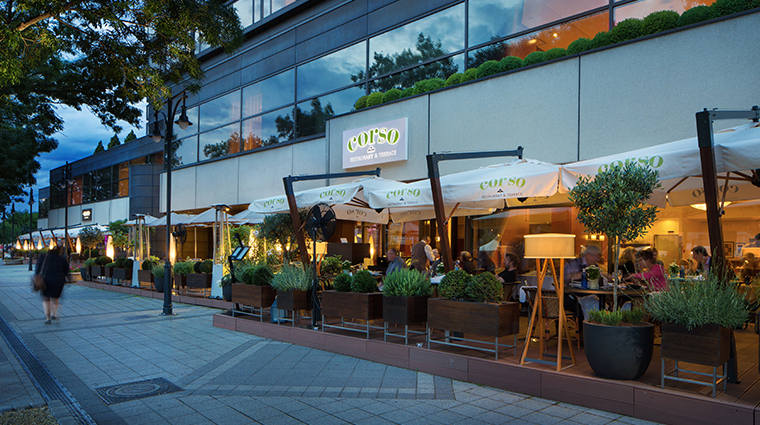 From late spring into early fall, you’ll be hard-pressed to find a seat at Corso’s terrace, which overlooks the Danube. Even though the view of the UNESCO Heritage site is gorgeous all day long, it’s at is most mesmerizing at night, when the bright lights of the Chain Bridge dance against the slow-moving waves. Hungary (and Eastern Europe as a whole, for that matter) isn’t typically known for its vegetarian or health-forwards dishes. However, Corso has upped its offerings for those diners with some delicious bites that go beyond simple pasta or soup. Dishes like curried pumpkin stew with a soft and silky poached egg and a truffle risotto highlight the winter while, in the summer, you’ll find salads made with grilled parmesan and fresh peach chutneys atop whipped cheese soufflés. Locals love Corso Terrace and Bar for two reasons: the fascinating seasonal cocktails and the live, Golden-Age-inspired Jazz music filling the air every Friday night.